Like it (or not) or want to use some of my pictures? Mail me and let me know. Just credit me for the picture. If you want the original picture, that's no problem either. I'd just like to know that someone liked them. The first 2 pictures are of the beginning and the end of the loading operation. The rest are just pictures taken that day and included to help determine how big these ships are by comparison. This ship (the Swift) will carry 27 barges and 2 large tug boats to Buenos Aries, Argentina to add to the fleet down there. Before loading these barges, it submerged itself into the river up to about where the anchor goes into the side. The barges were floated over the middle portion and secured. Then the 2 tug boats were floated between the barges and the front of the ship and secured. We watched from across the river about a mile away. After it is fully loaded, the ship will be raised and the bottom of the ship will be visible. Then it will be ready to travel to South America. This first picture was taken Saturday morning. It was very rainy and hazy. They had already started to float the barges over when we got there but were only about 1/2 finished. After that they floated the 2 tug boats over and secured them. The whole process from half way finished the barges to securing the tugs took only about a couple of hours. Then they started to raise the ship. It takes about 10 hours to fully raise the ship from submerged as you see it now. The Swift above is fully raised and is fully loaded. The barge passing in front of the ship is about the size of only one of those 27 barges it is carrying. Dockwise is the company who makes these types of ships. Visit their site. It is full of all kinds of information. A Dockwise ship called the Blue Marlin carried the USS Cole back to the US after it was attacked and damaged in 2000. In September 2004 the Blue Marlin delivered the largest moored semi-submersible oil platform in the world (ThunderHorse 59,500 tons) to the Gulf of Mexico from South Korea. 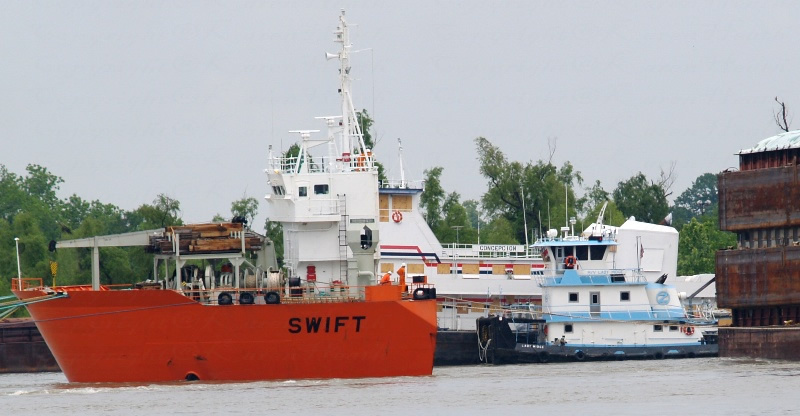 The Swift is 600 feet long and 105 feet across and can carry up to 25,000 tons of cargo. It will submerge to load and unload its cargo. It has 5 electrically driven ballast pumps with a capacity of 3,900 cu.m/hr and an additional 3 electrically driven cargo pumps with a capacity of 3,000 cu.m/hr. That is a total capacity of 6,900 cu.m/hr (1 cu.m/hr is about 35.31 cu.ft/ hr). Above and below, they begin to move the tugboats into position. 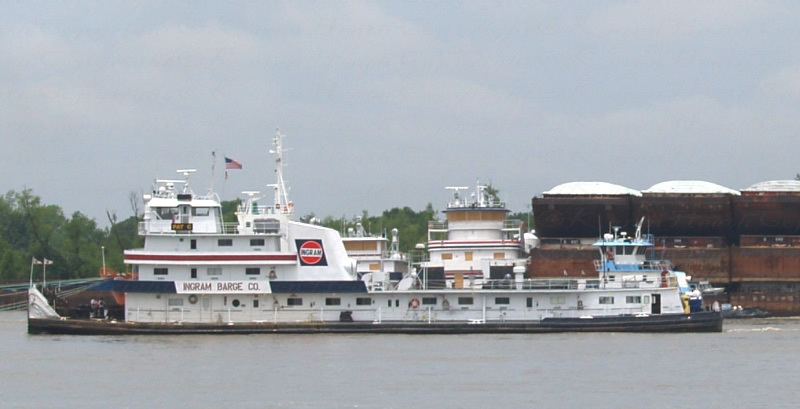 Below, the large tug in the foreground is about the same size as the larger tug above to be transported. Above is a barge just like the ones on the Swift but it is closer to us (probably half the distance to the Swift). Above is a tugboat just like the large one on the Swift but it is closer to us (probably half the distance to the Swift). Yet another set of pictures.